Decepticon Ravage is part of a team of Decepticon spies led by Soundwave. A loyal and dedicated operative, he is ruthlessly effective at getting the data he needs. Hidden in the shadows, he silently tracks his prey and strikes with ferocious force when the Autobots least expect it. Ravage�s first alternate mode is that of a data pad, akin to some touch screen tablets that have circulated the globe in recent years. The mode is essentially a somewhat flat block with a �screen� on one side. The faux screen features two stickers with quite a bit of detail on them, like some �Status� and �Surveillance� readouts, as well as some little touch screen �buttons� along the bottom. The detail is incredibly well done and it looks great � the major downside is that they are stickers on transforming parts, so over time they will have a tendency to peel up. So far mine has held up, but apparently this is an issue with increased play. The data pad mode has one really cool (if unnecessary) feature � a 3.5 mm jack on the top that actually accommodates a real life pair of headphones. Sure, it doesn�t actually work, but it�s pretty neat nonetheless. 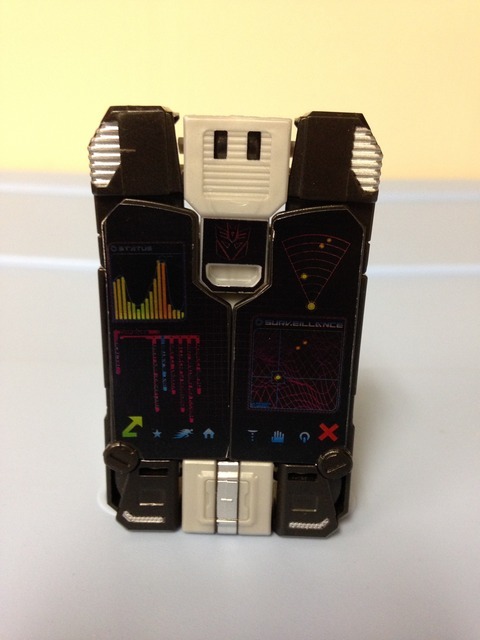 The data pad mode also fits nicely into Soundwave, so it�s got that going for it. Well, Ravage apparently has a jet mode on this figure, which is about as aerodynamic as a brick. I mean really, it is a flying brick. With wings and a cockpit. Seriously. I can only imagine that since Rumble can transform into a tank and Laserbeak/Buzzsaw can transform into a rolly fork-lift� thing, that Ravage also needed a third militarized vehicle. So here we are. The jet mode has �wings� which are the two sides of the data pad, and two tail fins that are just Ravage�s upside down rear legs. It looks about as ridiculous as you would expect, and doesn�t really serve any functions. I suppose it has a couple Titan Master pegs on the top, so a little guy can ride him like a surfboard. Yep. 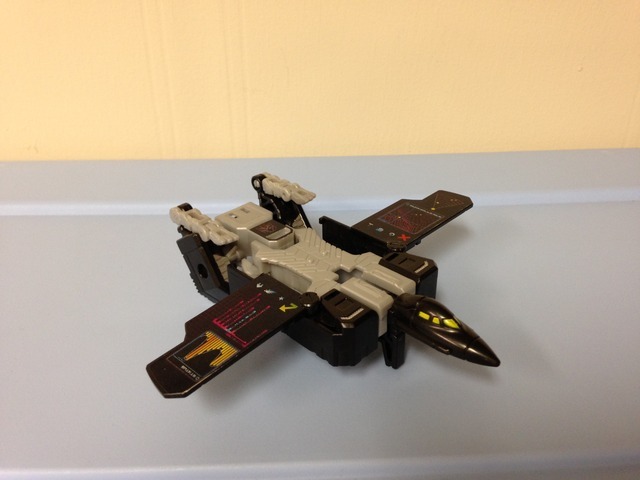 If jet mode wasn�t bad enough, Ravage�s jaguar mode is an atrocity. His legs function just fine and they have three hinge joints each. His head mold is nice, but the CGI renders made him initially look very fierce (since it was a digi-painted Stripes) � which didn�t pan out on the final product. It�s OK enough for what it is, and it moves on a hinge joint so you can move it up and down. Ravage features a stubby tail � like the ones you would find on a cropped-tail Boxer. The two sides of the data pad screen are now also situated on his back like some sort of oddball wings, and I get the impression that the designers just really didn�t know what to do with them. Ravage is also pretty darn wide due to how the sides stick out allowing for his legs to point down. It wouldn�t be that big of a deal if he wasn�t intended to be a sleek jaguar (but he is), and it also wouldn�t be that big of a deal if it didn�t leave some gaping holes in his back (but it does). If you haven�t figured it out yet, Ravage�s jaguar mode leaves a lot to be desired. 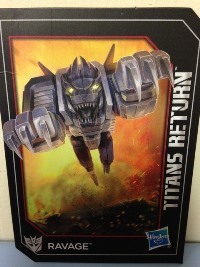 Transformation Design: 3 Ravage is a shifty block, and there really isn�t anything interesting taking place. Fold parts, move parts, blah. Durability: 7 The plastic is just fine, but the stickers will be a long term issue. I worry about the �wings� too. Fun: 4 For having three modes, the data pad mode is the best � which is really saying something since it�s just a block. Interacting with Soundwave is the only good part. Aesthetics: 5 Had the jaguar mode been tidied up, this would be slightly better. Those back wings and holes are just too much to ignore. And the jet mode is too blocky. The data pad looks neat though. Articulation: 4 His legs are well jointed, so to speak, but they don�t move sideways at all. Otherwise Ravage is quite static in every mode. 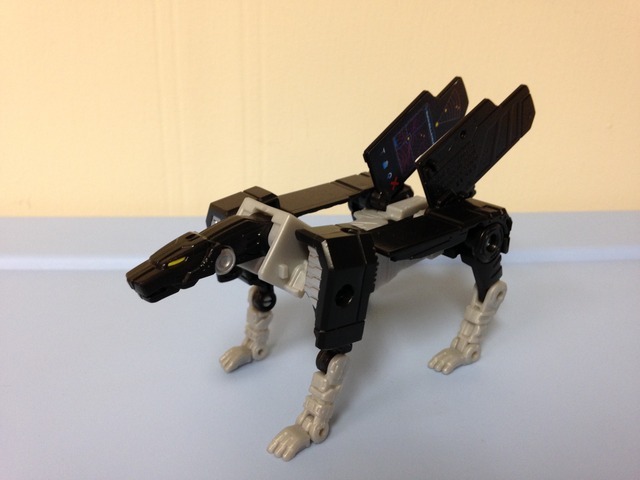 Value/Price: 3 As an accompaniment to Soundwave, Ravage is OK. Otherwise this is a really poor toy. To be honest he seems like a big waste of $10 USD. Overall: 2 The only thing going for Ravage is his ability to be used with Soundwave and the other data pads. I have zero reason to recommend him other than that, as his only good mode is to fold him into a block. Send this kitty out into the jungle and don�t look back.